Interesting Facts about Rangoli –You Had No Idea About! You might have seen your mother, grandmother, aunt or elder sister creating Rangoli on your verandah on festive occasions like Diwali. And you probably have tried your best and sometimes succeeded in making one completely on your own. Although the art seems pretty commonplace, it actually holds a lot of value and importance in Indian tradition. There are a number of myths and legends associated with Rangoli and like we have mentioned before, it holds a lot of value in India tradition and culture. The word “Rangoli” is derived from the Sanskrit word “rangavalii” which means showing your happiness and joy through various patterns of colors and pictures. The art is practiced not just in India; even in countries like Nepal and Bangladesh people create Rangoli. You must have noticed that rangolis are made in a variety of patterns. 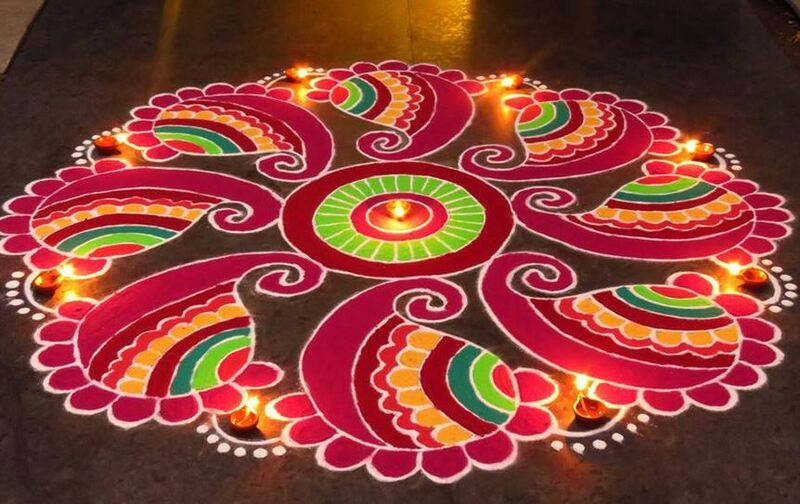 Some like to make diya Rangoli patterns, whereas some make simple flowers, peacocks and other less common Rangoli designs. No matter which pattern you are making, the idea is to celebrate the joy of the festival. The concept of Rangoli started during the time of “Satya-Yug” and there are plenty of myths and stories surrounding the same. However, just to keep you informed, each of these stories of Rangoli is related to the ultimate creator of the universe – Lord Brahma. In India, Rangoli is made on festivals such as Diwali, Pongal, Onam and Tihar. People believe that by carving Rangoli on their floor during these festivals, they are actually ushering in prosperity and wealth. A lot of people make Rangoli on events like marriages, while welcoming a newborn home or while moving into a new house. There are no hard and fast rules for making Rangolis. All you need is colored rice or flour, colored sand or flower petals. There is no end to variety when it comes to Rangoli designs – from designer Rangoli to routine ones; you can make any of your choice. In our country, people call this art by different names depending upon the region where it is practiced. For instance, people in West Bengal call it Alpana, in Tamil Nadu it is called Kolam, Chhattisgarh locals call it Chowkpurana and in Desert State Rajasthan it is called Mandana and these are just a few of the names Rangoli is known by. The main motive behind making a Rangoli is to bring/welcome good luck, prosperity, happiness and wealth to the family. But people also carve them to decorate the entry of their home. You probably don’t know this, but the patterns of Rangoli vary from fest to fest. There are different patterns for Diwali, Onam, marriages and other festivities. Also, the materials used may be different. However, this is no hard and fast rule and you can give your imagination free reign. We hope these interesting facts have made your day. The next time you make a Rangoli pattern, don’t forget to share this knowledge with everyone around.